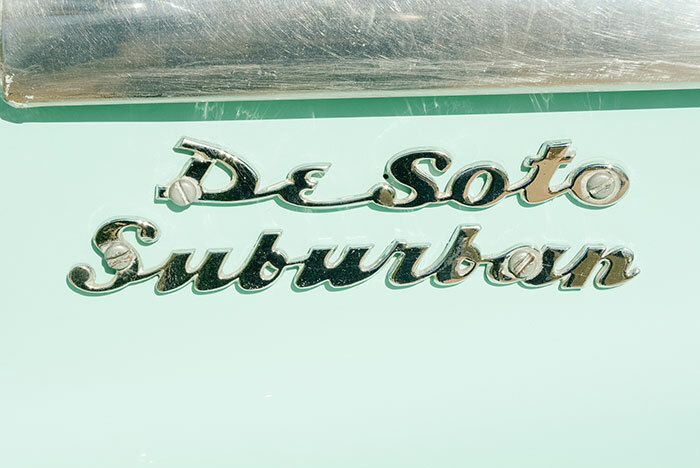 Founded by Walter Chrysler in 1928, De Soto’s model offerings served as a lower priced version of the other Chrysler Corporation products. 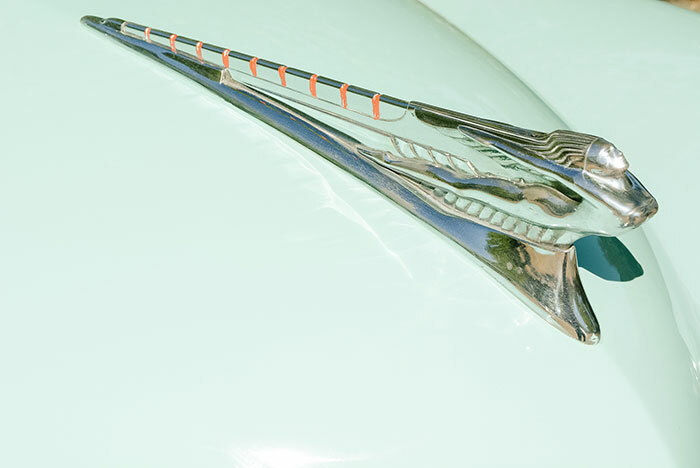 Just prior to WWII, aside from its Airflow models, the 1942 DeSoto was one of the company’s more memorable models It featured powered ‘Air-Foil’ pop-up headlights (“Out of Sight Except at Night” claimed the adverts), a first for a North American mass-production vehicle. 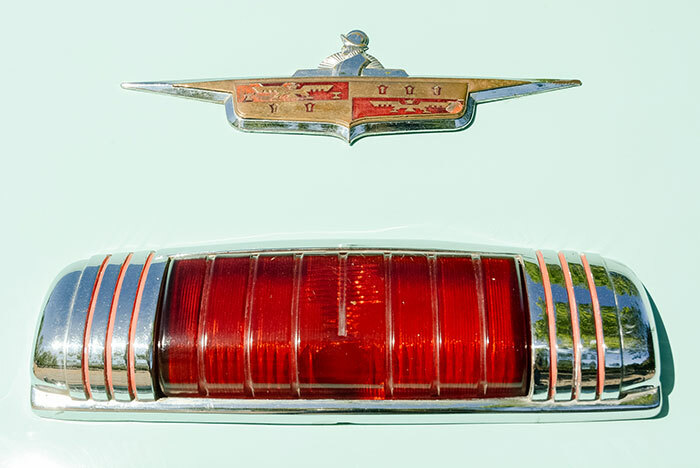 After wartime restrictions on automotive production were ended, DeSoto returned to civilian car production when it reissued its 1942 models in (base) Deluxe and Custom configurations with a redesigned grille and new bumpers but without the Air-Foil headlights, and with fender contours extending into the doors like other Chrysler products of the immediate post-war period. Ornamentation was new, too. A neat touch, including a speedometer that changed colours in increments: green to 39 mph, amber to 50 mph and red. 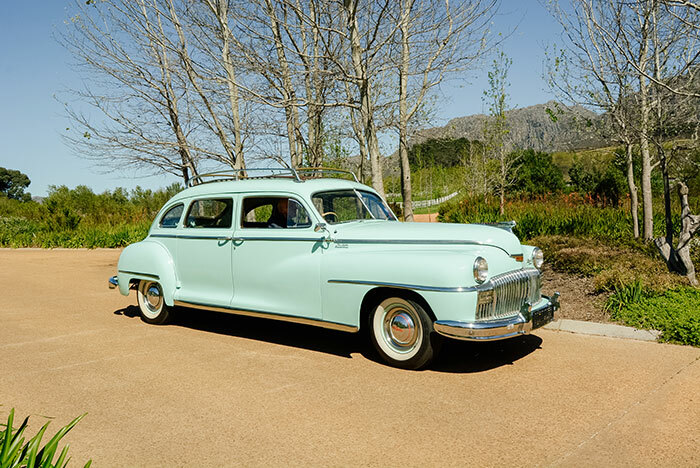 While all Deluxe models and the four base Custom models were built on a 121,5-inch (3 086 mm) standard wheelbase, three Custom models – sedan, limousine and Suburban – were built on a 139,5-inch (3 543 mm) long-wheelbase platform. Body length was consequently huge, no less than 225,3 inches (5 723 mm). It was 77 inches (1 956 mm) wide. 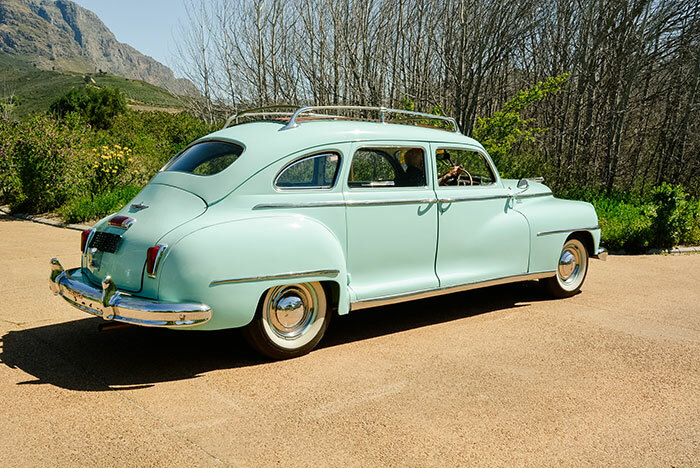 The Suburban appeared in the line-up in November 1946 and was billed as a four-door eight-passenger vehicle by virtue of ‘jump seats’ fitted behind the rear seats capable of carrying two adults – and maybe even three children. (In taxi spec, the DeSoto was classified as a nine seater.) The whole seat could be tipped up to increase the already huge boot space into a cavern. While the jump seat’s cushion was one piece, the backrest was centrally split with each half folding flat, increasing load carrying versatility even more. The back seat could be slid right forward to behind the front seats to create a near 1,8-metre load bed, increasing cargo volume even more. The only limiting factor was the conventional boot opening. Had it been a tailgate, then the Suburban would almost qualify as a pantechnicon, but after all it was a variation on a sedan body. 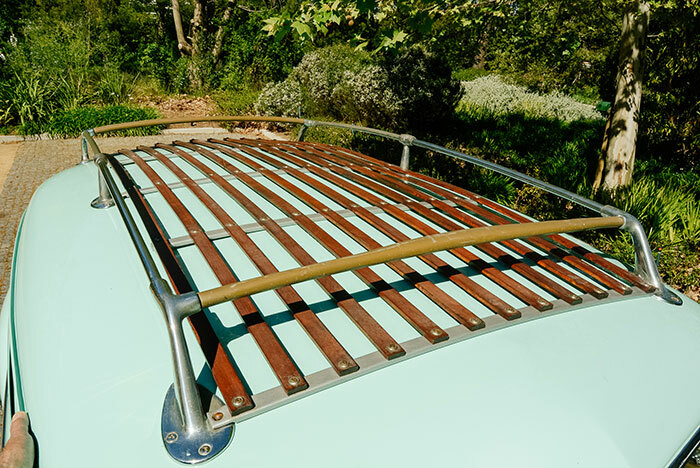 Oh, a full length roof rack was standard equipment. 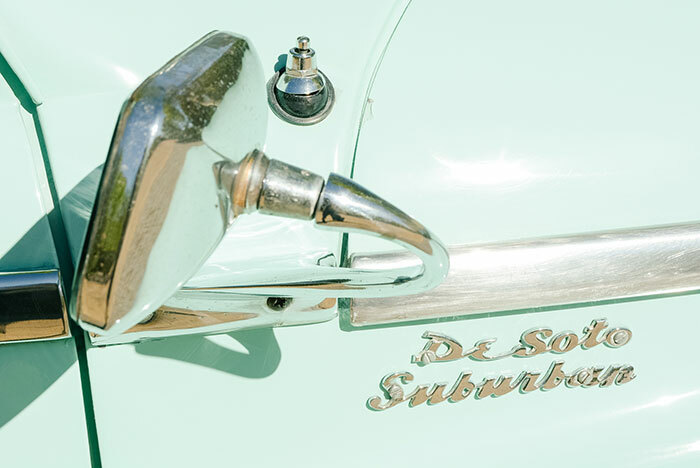 What did not go inside went on top… So it is easy to understand why immediately after WW2, the likes of Springbok Atlas Safaris and Transafrica Safaris bought Suburbans for use as tour buses, particularly for trips to the Kruger National Park. . The interior was quite classy. The cushions of the sumptuous seats had foam rubber pads, and the floor had tailored carpets. 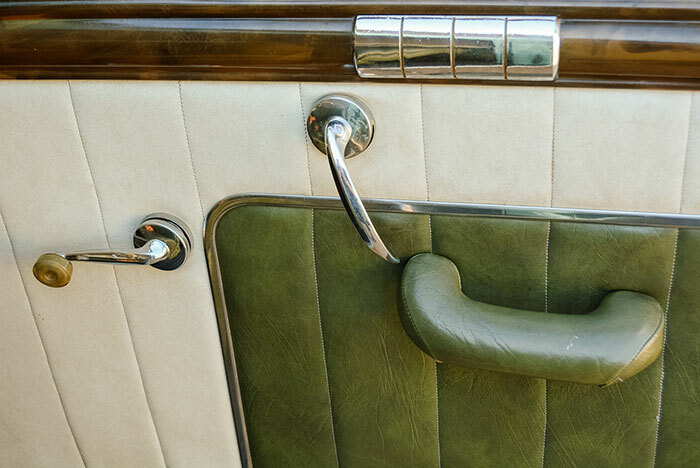 Burl and grain garnished dashboard and door cappings, leather upholstery and two-tone door mouldings with chrome handles and a full complement of courtesy lights and grab handles added a touch of class to the fittings. A push-button radio was also included. 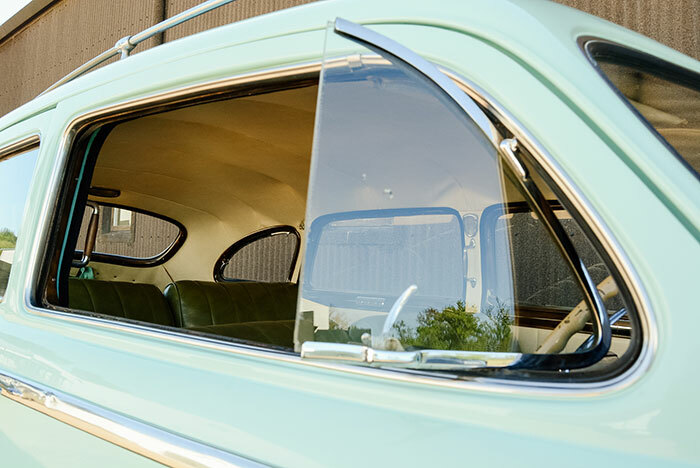 By contrast with the split windscreen, the front door windows feature frameless quarter-lights and the rear door glass is a single pane. Opening rear side windows helped ventilation. Under the l-o-n-g bonnet lies a fairly unstressed cast iron 236,7 ci (3 878 cm3) in-line six-cylinder engine running in four main bearings. 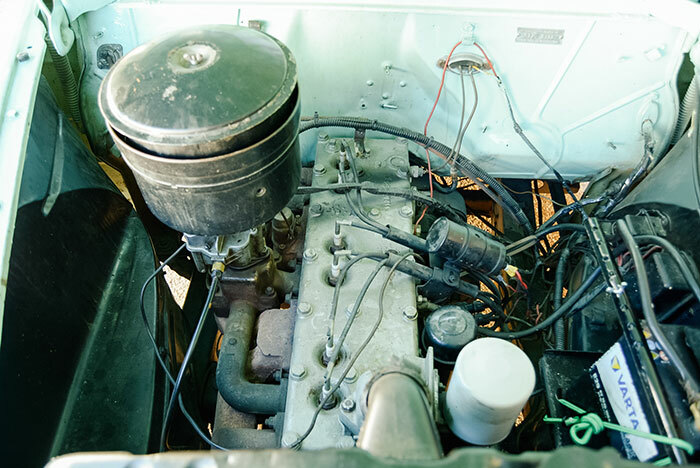 The side-valve motor had lifters and was fuelled by a Ball and Ball carburettor with a 6,6:1 compression ratio. An Oilite fuel tank filter was a standard item. Peak power was 109 bhp (81,5 kW) at 3 600 r/min and maximum torque was 260 N.m at 1 200. 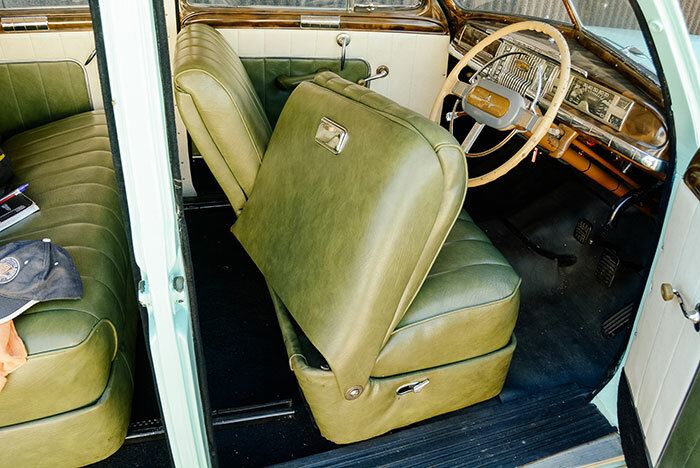 A three-speed manual gearbox was standard on the Deluxe with a two-speed Fluid Drive ‘Tip-Toe shift’ standard on Custom models – optional on Deluxe. 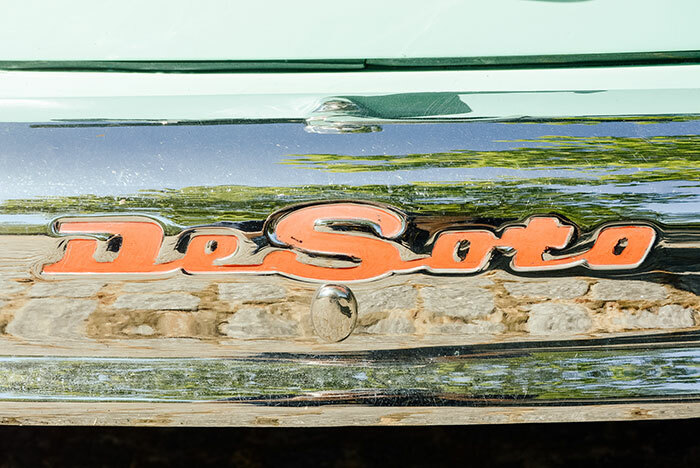 Although called Fluid Drive, the DeSoto transmission was in reality a two-speed manual transmission with a conventional clutch mounted behind the same fluid coupling unit that was installed in straight Fluid Drive cars. Theoretical top speed was 119 km/h and 12-inch (305 mm). Safe Guard hydraulic drum brakes were fitted all round. White-wall 6.50×16 tyres (later 7.00×15) were standard on Custom models. FMM’s bright green 1947 Suburban Fluid Drive is quite an imposing sight and the rear-hinged (‘suicide’) rear door is a surprise, although useful in the DeSoto’s limousine and taxi model variants. As the output figures suggest, the engine is what can be termed a ‘lazy six’ – powerful enough to do the job but do not expect any fireworks. With a 1 900 kg kerb weight, performance is leisurely, the easy-going transmission precluding having to keep things on the boil. But what the engine proved to be is robust and reliable if properly maintained. 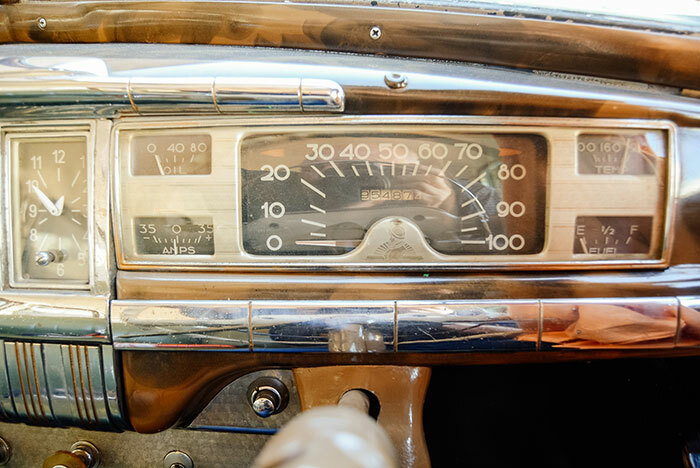 According to a report in local motoring historian Fred Schnetler’s book A Century of Cars, anything up to 300 000 km was usual before the engine needed attention, and once they reached half-a-million miles (800 000 km), the tour operators sold them to taxi operators. Providing the suspension has not gone soft, big, heavy cars always provide a stable ride and the Suburban did just that. 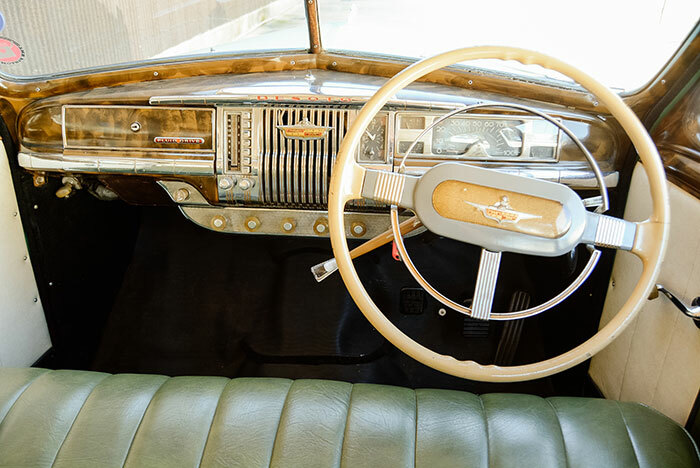 The big, stylish plastic steering wheel with horn ring proved to be reasonably weighted, even when manoeuvring, which can be a bit of a chore because of the car’s large turning circle. But its space and pace were ideally suited to the roles it played, offering passengers a stretch limo experience for travelling the length and breadth of the country to view our wild life, or simply acting as a multipurpose people/load carrier. Either way, it fulfilled its purpose while offering all the creature comforts of a passenger car rather than the otherwise more commercial vehicle approach.